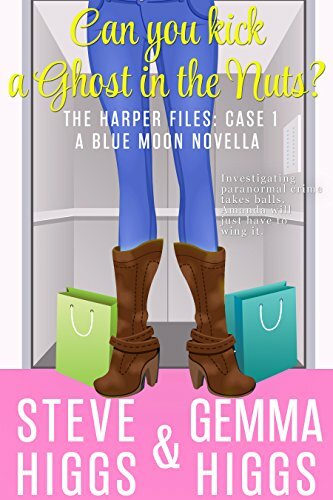 Today I’m interviewing Steve Higgs, who writes the Blue Moon Investigation Agency series. 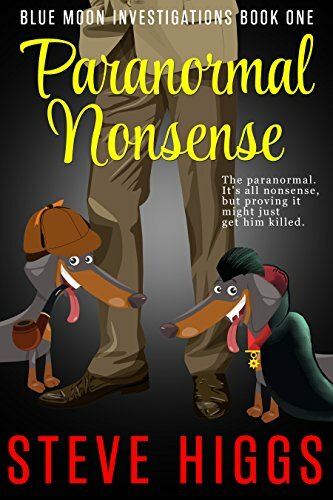 It’s a humorous Paranormal cozy mystery, so needless to say I love it. Read on for more about him. Steve Higgs won his first award for writing when aged just ten. Of course, saying it was his first award suggests that there have been more since, which there haven’t. However, years of writing stories to entertain himself eventually resulted in something worth publishing and the Blue Moon Investigation Agency came to life. Here’s the author, making a way more serious face than the tone of his books. DR- How did you decide to write in your genre? SH- The truth is that I didn’t decide to write in a particular genre. I wrote what I wanted to write, only hearing the term cozy mystery when I first published and started getting reviews. The stories aren’t strictly cozy either though, more a blend of crime thriller/comedy thriller/cozy mystery and paranormal investigation. The answer then is that I fell into it because I had an idea. DR- What’s the easiest or hardest thing about writing for you? SH- The easiest part of writing is that the stories are already in my head forming an unruly queue to get out. My writing process is mostly about finding the time to sit at my laptop to let the words flow out of my fingers. The hardest part is that at this time I have yet to reach a point where I have enough work published to support myself. The net result being that I still have to work a full-time job as well and rise each morning at 0500 hours to fit in some writing. DR- Tell us about something in real life that inspired a character, setting, or plot in one of your books. SH- There are a lot of scenes in my books where the chaps get ‘em roiled in sexual exploits. All off screen of course and only referenced, but one central character, a six-foot seven-inch Adonis called Big Ben, annoys the other men and disgusts the ladies with tales of his latest conquest. Most of this is drawn either from my life or from anecdotes I have heard. In addition, the main character is a former soldier, drawing on his training continually to overcome challenges – I was a soldier for 25 years. DR- What do you do when you’re stuck on a scene? SH- A typical writing day start blearily at 0500 hours as I quietly roll out of bed without disturbing wife or child or dogs. Two hours of writing leads to 30 minutes in the gym, breakfast and cycle ten miles to work. In my lunch break I will check and adjust ads and perhaps craft a newsletter. After my 3-year-old goes to bed, I will try to knock out a few more words. How involved I get at night really depends on where I am with a story. In the dying stages, as I reach the exciting conclusion it is common for me to just not go to bed. DR- Is there a common theme or element in your work? SH- The common theme is humour but also that the paranormal is not real. The MC investigates paranormal cases due to a typo in an advert. He has clients lining up with cases no one else can explain which makes it sound like the x-files, but it was perhaps best described by one reviewer as a Jack Reacher story trapped in a Scooby Doo episode. DR- Where can we find your books? Which one should a new reader start with? ​SH- My books are exclusively on Amazon and are chronological. There are two different series though and they both overlap and intertwine as the two main characters work at the same firm. The readings order can be found on my website, but I would direct every new reader to start at Paranormal Nonsense which stars Tempest Michaels. The star of the second series is Amanda Harper and she is the first character to appear in the very first book. If you love deeply funny, page-turning mysteries like those by Amanda M Lee, Margaret Lashley, Cassie Rivers, Janet Evanovich, Joanne Fluke, Meredith Potts or Lily Harper Hart then you are missing out if you don’t try this series!